So, Daredevil #511 is here, the last issue before the ominous-sounding The End. For this issue, I’d like to do a little run-down of the good and the bad. Let’s start with the good. There’s no denying that Daredevil does a much better job than Shadowland when it comes to setting the mood. Hell’s Kitchen feels like a real place (well, it is a real place, but you know what I mean) and both the art and the writing go a long way to making the chaos and darkness of the streets seem tangible. Using the little guy’s perspective is a smart move and makes sure this title moves in more familiar Daredevil territory. Diggle seems to really like writing Dakota, and it shows. She carries much of the issue and is the real action star of this whole arc. It makes me wish they’d given this book to her, rather than Black Panther, come December. Even though her scene is a little longer than it needs to be, it was good to see Becky again. She’s also a well-written relatable character and I like the relationship between her and Dakota. Now, if only the artists would give her a wheelchair that looks like something an active thirty-something paraplegic would use in the real world (as opposed to something you’d find in an emergency room), I’d be even happier. Most of the scenes with Detective Kurtz work okay and we get a semi-satisfactory explanation for why the police is now back in Hell’s Kitchen when they’d basically left the area previously. It’s been touched on before, but the art is really nice overall even though it may not be as dynamic as it could be in places. I just have one question: What’s up with Dakota’s hair? Did she get a haircut since last time or did I miss something? Roberto de la Torre is flying solo this issue (as is Diggle on the writing) which makes the finished product fit together nicely. Daredevil doesn’t appear much in this issue, and it’s a sad thing that it’s probably better for it. It’s becoming harder and harder to disregard the event that provides the backdrop for this story and I’ve made no secret of the fact that Shadowland stopped working for me two issues ago. At the end of the day, I’ve stopped caring about what happens. 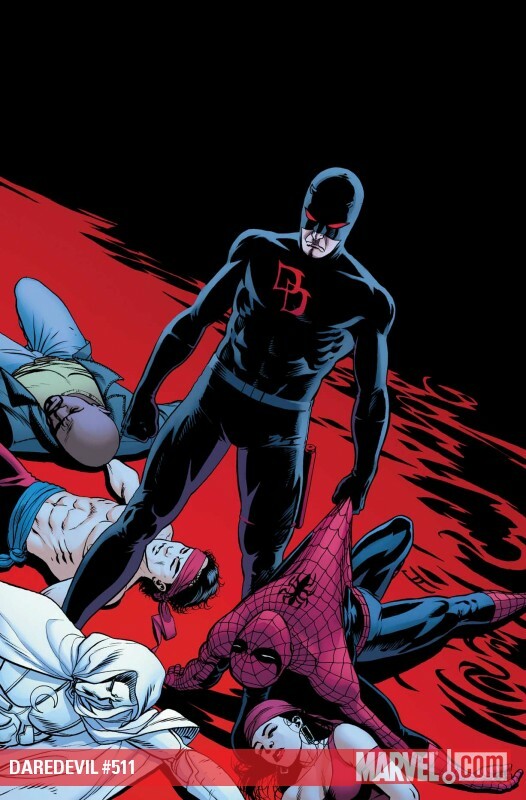 I run a blog devoted to Daredevil and I no longer care what happens to him. Bring me Daredevil: Reborn or even a reboot, but let’s just get this over with. What is up with Foggy? Diggle writes his two female co-workers well, but this incarnation of Foggy isn’t working for me. Last issue, he was in hysterics and this issue he accomplishes a near superheroic feat by scaling the outside wall of Shadowland itself. I don’t buy that he could do that, and I don’t buy that he would even try. Foggy hasn’t been acting like the smart guy he really is lately. The part where Detective Kurtz apparently doesn’t know for sure that Matt is Daredevil was just awkward. I was under the impression that this would be one of those “don’t ask, don’t tell” areas for Kurtz and Dakota, but that Kurtz wouldn’t seriously doubt that Matt is actually Daredevil. There are certain other things that don’t quite make sense to me. One thing is why Dakota and Foggy aren’t affected by the darkness that spreads through Hell’s Kitchen. It’s like the old issue where all of New York goes blind except the cab driver Matt finds to take the temporarily blinded Foggy to his ophthalmologist (the only other person in the city who isn’t blind). Well, that’s it. Throw your two cents in. Based in Stockholm, Sweden, Christine is a die-hard Daredevil fan who launched The Other Murdock Papers in 2007 to share her passion for Matt Murdock and his friends with other fans. Never miss a post! Get an email whenever there is new content. Well, if it’s all the same to you, I liked the little cameo by JJJ. I’m with ya. I just can’t wait for this thing to be over. What promised to be THE event of the year turned out to be a joke. No one likes it, no one gets it, it didn’t get Daredevil new fans and it antagonized the old ones. I really don’t get what Marvel and Diggle were going for here. I do not know a single soul who is enjoying this (granted, that is no parameter, if the thing is selling, then, well…). And Foggy’s role in Shadowland just makes me want to set myself on flames. Also, what in the world is Ghost Rider doing in Shadowland? I thought he was done with all of this. It’s either a glaring error by the artist, or this issue also managed to spoil Shadowland #5 (in which, I guess, GR gets punked by Daredevil too?). Foggy Nelson scaling a wall like he’s freakin Spiderman: The moment that turned a mediocre issue into a joke. I like Andy Diggle. I’ve read many of his other works, but he is not suited to write Daredevil/Matt Murdock. I am starting to wonder if Antony Johnston hasn’t been the deciding factor between good and bad since Diggle’s run started. Diggles first DD arc – boring and drawn out, easily could have been 2 -3 issues. DD 508-510 – co written by Johnston – only readable parts of this fiasco. DD # 511 – Diggle alone – well…. Foggy Nelson scaling a wall like he’s freakin Spiderman. God, you know I love Foggy, but doing all that the climbing from the ground was quite a stretch for credibility, no matter how desperate he might feel. In “The secret life of Foggy Nelson”, he barely managed to climb down from a window: Honestly, him getting inside through a backdoor or the fire evacuation stairs of Shadowland would have been more believable. And, as you say, Foggy’s forte is (should be) his brain and wit. I appreciate the climb as a metaphor of Foggy trying to do his utmost for Matt, but even if the bricks of Shadowland favour casual climbing, I think that such a feat would be quite complicated to someone with no experience in this regard. Well, they just posted the preview for Daredevil 512 on Newsarama. Another nice kick to the balls from Marvel, from the description and preview this is actually “Black Panther” 512. We don’t even get a final Daredevil issue. In the whole of Shadowland we don’t get anything resembling a story about or involving Matt Murdock. We get a Saturday morning cartoon villain screaming and posing. Andy Diggle should be ashamed of himself for turning in this garbage. If this was all editorial, fine, but be a man and say so like Straczynski did when Marvel f***ed Spiderman. @Robert – I have to disagree about the “be a man” bit. You don’t bite the hand that feeds you (unless you know there is someone else that will do so). Andy Diggle works for Marvel. He either “stands up” to Marvel and goes without a job, or he continues to work and cashes another check. Maybe you don’t “bite the hand that feeds you”, but if that hand is feeding you rotten food, you might refuse to eat or bare your teeth a little to let them know this is unacceptable. Then if they try to force feed you, then you know they aren’t in any way serving your best interest. Then you damn well bite them and find a new hand. If its just about a paycheck, for anybody, then the battle is already lost. My metaphor is not working, so I’ll just get to the point. You’re talking about insubordination. You’re saying he should quit his job on principle. I’m all for idealism, but we can’t all afford to quit our jobs because we don’t like something about our employer. No one would have a job then. Sometimes, you gotta look out for number one, as harsh as that may sound. Also, it would be incredibly unprofessional on Diggle’s part. Diggle has insisted that this (including Reborn) is the story he pitched, but I would argue that the Black Panther segue is not, nor was the idea to make an event of it. My guess is that Diggle is responsible for the core elements of the story, but not some of the mismanagement that has added insult to injury. As I said in my earlier post, I’ve read a lot of his previous work. All good. I was excited when he was announced as writer. Someone should get the blame for this garbage, I’d rather it not be Diggle, cause I respect him and have zero respect for Marvel these days. And back to the Black Panther thing. Even if you’re a Panther fan also, continuing to buy “The Man Without Fear” is just telling Marvel this was all a good idea and encouraging them to do more of the same. Its not gonna kill anybody to have your DD collection go from 512 to 525 or whatever issue it reverts back to Daredevil. If it reverts back. I believe Foggy is the most grounded element of this entire event and this issue proves it. Everyone else has pretty much forsaken Matt to the point that they are now (apparently) willing to kill him. EXCEPT Foggy. Yes, his comments may have gotten tiresome over this event, but I feel it shows the strength & depth of his friendship with Matt. In Foggy’s opinion, whatever Matt has done, for whatever reason, it can be fixed, forgiven, and redeemed . Can Foggy scale the wall of a Japanese fortress? No (especially in one night) but his dialogue during such made it more plausible for why he would undertake such a dramatic, daring deed. Had this event gone the correct route, the final scene would’ve been chilling and dramatic. Instead it falls completely flat. Throughout this event, I haven’t felt the least bit of awe, dread, terror, even fear from the Beast-possessed DD. He hasn’t done anything. He’s a pale shadow of a villain. Thus his comments at the end were hollow and empty. I still think Foggy has an important part to play in this. I just hope it doesn’t get him killed. The rest of the issue was great. If anything, the regular DD title has kept this event more tolerable. Else the whole thing would be complete rubbish. Here’s my alternative pitch: have Foggy attempt to climb the outside of Shadowland because he’s desperate to save his best friend. Have him fail. As he falls off the wall (maybe he makes it 10 feet off the ground at best, but this could easily be as many panels as the comic used and would more clearly emphasize the futility of Foggy’s actions), White Tiger stands over him and brings him before Matt. Events then play out as in #511. You see Foggy’s desperation and devotion; you get Foggy inside the fortress and before Matt; you don’t defy the laws of physics and biology. Mission accomplished. That took me about 30 seconds to come up with. Even assuming Foggy could climb inside, how did he avoid being noticed and killed by ninja sentinels along the way? 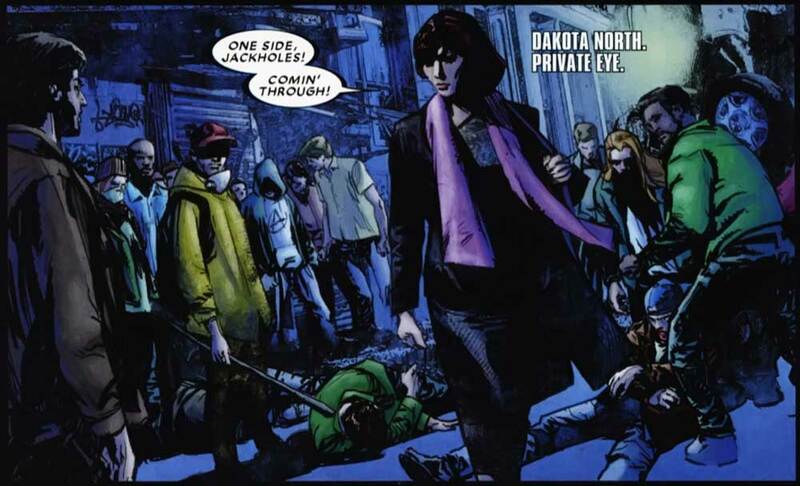 Colleen Wing — a ninja herself — had to kill about four of them when she attempted the same stunt in DAUGHTERS OF THE SHADOW #1. (I expect this rebuttal: “Security has changed since SHADOWLAND #3”. Yes, but one does not usually defend a siege by *allowing people inside more easily than before*. One defends the walls *more* staunchly, rather than less.) And, why didn’t White Tiger just kill Foggy the moment she discovered him inside Shadowland? Didn’t she *just* order a hit on his and Dakota’s lives two issues ago? And again last issue? @Christine – Overall, I think your scores for almost every Shadowland-related issue (including the main series and tie-ins, with the sole exception of BULLSEYE) have been overly generous. Do you really think this issue and the two preceding were better than DAREDEVIL #106 (6.0/10) and equal to #115, the only issues of DAREDEVIL that have scored this low since your monthly reviews began over two years ago? (I made a spreadsheet. Yes, really. I started looking for scoring trends in your reviews a few months back. Never let my geek cred be called into question!) Is 5.0/10 “average”? Or is that a failing grade, as it would be in school? I like rubrics. You just spent more time thinking about the plot and story points of this clusterf*** than Marvel editorial did. Since 2007, The Other Murdock Papers has been serving up news, views and reviews about the Marvel superhero Daredevil. Whether you’re a new fan or have been following the adventures of Matt Murdock for decades, I hope you’ll find something to read and keep coming back for more!